The Job Description for a Pastor is, of course, one of the most important of all the church job descriptions. The purpose on this job description for Pastors states: The role of the Pastor is to assist the Elders in overseeing the life and direction of the church. The Pastor will have a firm grasp on the purpose, values and strategy of the church and the ability to align ordained and lay staff and key leadership teams with its mission. 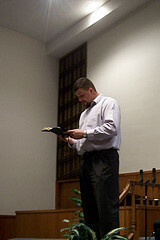 The Pastor will offer pastoral leadership to the congregation alongside clergy and lay ministers. The Pastor will ensure that the systems, practices, and policies of the church responsibly and effectively support its ministry activities. programs in discipleship and ministry training, in coordination with other ordained and lay leaders. a. Coordinating/leading weekly staff meetings and other activities to clarify and execute goals and objectives. b. Monitoring the spiritual pulse of the congregation through review and accountability. c. Ensuring staffing, facilities and programs are effectively aligned to meet strategic goals. a. Overseeing staff training and development. d. Working with the Personnel Team to implement salary reviews and recommendations. e. Maintaining efficient and effective lines of communication between the staff and elders. f. Serving as HR manager – oversee the negotiation of insurance and other benefits, conduct performance evaluations, and provide ongoing informal performance feedback. a. Oversee the pastoral care needs of the congregation and, as necessary, share with other ordained and lay ministers in hospital visitation, home visits, counseling, marriages and funerals. the front office support functions. c. Oversee development of and adherence to church policies and procedures. Evaluation and Compensation: The Pastor will file monthly reports to the Elders on ministry accomplishments and activities. The Personnel Team will conduct annually a performance evaluation and review of the compensation package. There are two different job descriptions below to choose from to use as a guideline to create one for your church or organization. Return to Church Job Descriptions from Pastor Job Descriptions.